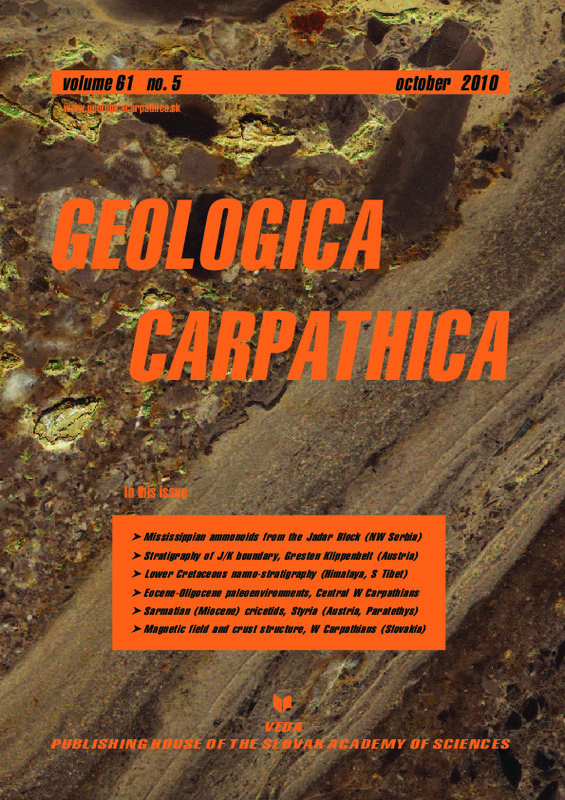 Abstract: The outcrop at Milivojevica Kamenjar in Druzetic (Jadar Block, Vardar Zone, NW Serbia), which exposes a fossiliferous limestone olistolith, is one of the key sites for Carboniferous stratigraphy and paleogeography in the Balkan Peninsula. Its age has been debated several times, and re-examination of the succession was required. Based on ammonoids and conodonts, an interval spanning from the latest Devonian to the basal Serpukhovian is represented. From the early late Visean portion of the section, the new ammonoid genus and species Ubites filipovici gen. nov. et sp. nov. is described. Entogonites tetragonus (Kullmann, 1962), a formerly misinterpreted ammonoid species, is revised. Abstract: The key objective of investigation of hemipelagic sediments from the Gresten Klippenbelt (Blassenstein Formation, Ultrahelvetic paleogeographic realm) was to shed light on environmental changes around the Jurassic-Cretaceous (J/K) boundary on the northern margin of the Penninic Ocean. This boundary is well exposed in a newly discovered site at Nutzhof. Around the critical interval including the boundary, this new outcrop bears a rich microplanktonic assemblage characterized by typical J/K (Tithonian/Berriasian) boundary faunas. The Nutzhof section is located in the Gresten Klippenbelt (Lower Austria) tectonically wedged into the deep-water sediments of the Rhenodanubian Flysch Zone. In Late Jurassic–Early Cretaceous time the Penninic Ocean was a side tract of the proto-North Atlantic Oceanic System, intercalated between the European and the Austroalpine plates. Its opening started during the Early Jurassic, induced by sea floor spreading, followed by Jurassic–Early Cretaceous deepening of the depositional area of the Gresten Klippenbelt. These tectonically induced paleogeographic changes are mirrored in the lithology and microfauna that record a deepening of the depositional environment from Tithonian to Berriasian sediments of the Blassenstein Formation at Nutzhof. The main lithological change is observed in the Upper Tithonian Crassicollaria Zone, in Chron M20N, whereas the J/K boundary can be precisely fixed at the Crassicollaria–Calpionella boundary, within Chron M19n.2n. The lithological turnover of the deposition from more siliciclastic pelagic marl-limestone cycles into deep-water pelagic limestones is correlated with the deepening of the southern edge of the European continent at this time. Within the Gresten Klippenbelt Unit, this transition is reflected by the lithostratigraphic boundary between siliciclastic-bearing marl-limestone sedimentation in the uppermost Jurassic and lowermost Cretaceous limestone formation, both within the Blassenstein Formation. The cephalopod fauna (ammonites, belemnites, aptychi) and crinoids from the Blassenstein Formation, correlated with calcareous microfossil and nannofossil data combined with isotope and paleomagnetic data, indicate the Tithonian to middle Berriasian (Hybonoticeras hybonotum Zone up to the Subthurmannia occitanica Zone; M17r–M21r). The succession of the Nutzhof section thus represents deposition of a duration of approximately 7 Myr (ca. 150–143 Ma). The deposition of the limestone, marly limestone and marls in this interval occurred during tectonically unstable conditions reflected by common allodapic material. Along with the integrated biostratigraphic, geochemical and isotopic analysis, the susceptibility and gamma-ray measurements were powerful stratigraphic tools and important for the interpretation of the paleogeographic setting. Two reverse magneto-subzones, Kysuca and Brodno, were detected within magnetozones M20n and M19n, respectively. Abstract: Calcareous nannofossils of Aptian-Albian age were found in the basal part of the Shadui Formation, Northern Tethyan Himalayas, Southern Tibet. The predominantly shale strata are exposed near the northeastern tip of Yamdrock Tso Lake at the locality of Bangbu and they were previously considered to be of Late Cretaceous age. Occurrence of the nannofossil species Prediscosphaera columnata and Cribrosphaerella ehrenbergii indicates the Upper Aptian–Lower Albian Zone BC23. Nannofossil species of Late Albian, Cenomanian or younger Cretaceous age were not present in the studied part of the Shadui Formation. Nannofossils are badly preserved and hardly identifiable probably as a result of strong post mortem etching and dissolution during burial. The depositional setting of the Shadui Formation is interpreted as hemipelagic to pelagic. A horizon of dark shale in the lower part of the Shadui Formation may be stratigraphically correlated with ocean anoxic event OAE1b. The discovery of calcareous nannofossils at the Bangbu locality increases the stratigraphic precision in the correlation of Cretaceous strata between hemipelagic-pelagic facies and shelf depositional areas in the Tibetan Tethyan Himalayas. Abstract: The sedimentary sequence of the Central-Carpathian Paleogene Basin provides proxy records of climatic changes related to cooling events at the Eocene/Oligocene boundary (TEE). In this basin, climatic deterioration is inferred from the demise of the carbonate platform and oligotrophic benthic biota in the SBZ19 and from the last species of warm-water planktonic foraminifers in the E14 Zone. Upper Eocene formations already indicate warm-temperate to cool-temperate productivity and nutrient-enriched conditions (Bryozoan Marls, Globigerina Marls). Rapid cooling during the earliest Oligocene (Oi-1 event) led to a temperature drop (~11 °C), humidity, fresh water influx and continental runoff, water mass stratification, bottom water anoxia, eutrofication, estuarine circulation and upwelling, carbonate depletion, sapropelitic and biosiliceous deposition, H2S intoxication and mass faunal mortality, and also other characteristics of Black Sea-type basins. Tectonoeustatic events with the interference of TA 4.4 sea-level fall and the Pyrenean phase caused basin isolation at the beginning of the Paratethys. The Early Oligocene stage of Paratethyan isolation is indicated by a stagnant regime, low tide influence, endemic fauna development, widespread anoxia and precipitation of manganese deposits. The episodic rise in the sea-level, less humid conditions and renewed circulation is marked by calcareous productivity, nannoplankton blooms and the appearance of planktic pteropods and re-oxygenation. Paleogeographic differentiation of the Carpatho-Pannonian Paleogene basins resulted from plate-tectonic reorganization during the Alpine orogenesis. Abstract: The recent discovery of a terrestrial vertebrate assemblage in the clay pit St. Stefan at Gratkorn (Austria, Styrian Basin) is of major importance for our understanding of the evolution of late Middle Miocene mammal assemblages in the Paratethys realm. The cricetid rodent assemblage includes four species: Megacricetodon minutus Daxner, 1967, Democricetodon sp. nov. (sensu Kalin & Engesser 2001), Eumyarion sp., and “Cricetodon” fandli sp. nov. The latter species belongs to the “Cricetodon” fandli-C. klariankae Hir, 2007 lineage, which allows for a long-distance correlation with other late Middle Miocene/earliest Late Miocene European localities. The biostratigraphic conclusions drawn from the study of the fossils from Gratkorn concurs with the age estimates based on regional geology, paleomagnetic measurements, and the gastropod-based biostratigraphy at the base of the Late Sarmatian s. str. (late Serravallian, latest Volhynian), around 12–12.2 Ma (Chron C5An.1n) ago. Abstract: A new digital magnetic map of Slovakia on the scale of 1:200,000 and 1:500,000 was compiled at the end of 2008 as the output of database magnetic objects from the whole territory of Slovakia at a scale of 1:50,000. The variable geological structure of the West Carpathian crust is depicted in the equally variable magnetic field of this region. A sizable number of magnetic anomalies with manifold character have been recognized. The basic anomalies distribution was divided into two groups: anomalies connected with rocks of the pre-Neogene basement and anomalies which originate in Neogene and Quaternary volcanic products. Most of the significant anomalies in the pre-Neogene basement were interpreted, modelled and consequently its geological and tectonic classification was worked out. On the basis of the anomalous field features, the following sources of anomalies have been distinguished: a) known, located on the surface, or at shallow depths verified by boreholes, mainly expressed by simple morphology, b) deep-seated and expressed by complicated morphology, reinterpreted or newly interpreted and also problematic. According to our present knowledge the interpretations are insufficient and remain open for further investigation. The above mentioned sources of magnetic anomalies are classified in terms of tectonic provenience to the main tectonic units.